Some options on this tab are dependent on the format of the selected genealogy file and may appear grayed out as seen in the above screen shot. Include memos/notes - Include the extra text that goes along with an event. Include text exhibits - Include these text attachments (Master Genealogist). Limit text length - Text will be cut off after the specified number of characters. Include Research Log - Master Genealogist and Legacy only. Include completed tasks - Includes tasks that have been marked as completed. Keep original line breaks (GEDCOM) - If the text displayed on your device appears to run lines together with no paragraph breaks, try selecting this option. 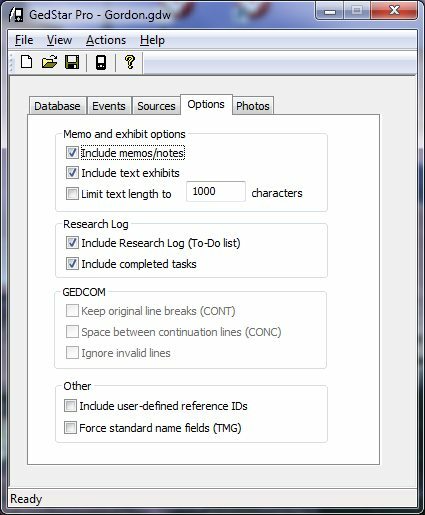 Space between continuation lines (GEDCOM) - If the text displayed on your device has words that run together with no space between them, try selecting this option. Some genealogy programs do not follow the standards correctly. Ignore invalid lines (GEDCOM) - Ignores blank lines and other lines that do not conform to the standard. Otherwise, these types of errors stop the conversion. Include user-defined reference IDs - Master Genealogist only. Force standard name fields - Master Genealogist only. This is useful in case you have defined a custom name structure format, such as renaming Surname to a different language. As long as you have kept the same ordering of the standard fields and have only changed the names of the fields, you should check this box to get the converted names into a standard format within GedStar Pro.